Whew. Are the upsets finally over — for a few days, anyway? The NCAA tournament — this baffling, chaotic, incomprehensible what’s-next? NCAA tournament — now advances to the rounds with numbers for names. Sweet 16, Elite Eight, Final Four. And it moves on without No. 1 Virginia, without defending champion North Carolina, without all four top seeds in the South region, which is the first time in the 40-year history of tournament that’s ever happened. It moves on without Xavier and Cincinnati, neighbors and Nos. 1 and 2 seeds in their regions. They played in the same arena Sunday and, in order, blew 12 and 22-point leads in the second half to lose. Nashville suddenly became Death Valley to the city of Cincinnati. It moves on without Tom Izzo and Roy Williams, without anyone from the Pac-12, without young phenoms such as Deandre Ayton, Collin Sexton and Trae Young. Gee, is there anyone left? Oh, yes. Still plenty to hang a tournament upon. Sixteen things to see in the Sweet 16. No. 1: Mike Krzyzewski vs. Jim Boeheim. Krzyzewski just turned 71, so it’s not often he gets to be the younger coach in a game. Coach K – for kid, in this case – will be going against 73-year-old Boeheim Friday in Omaha. Two men who have won 2025 games between them. But never mind the clash of AARP membership cards. It’ll be Duke’s 85-points-a-game offense against the Syracuse zone, which has suffocated Arizona State, TCU and Michigan State, giving up 56, 52 and 53 points. Duke is shooting 55 percent in the tournament, and 45.1 percent from the 3-point line. This ought to be interesting. Syracuse is allowing 34.3 and 28.9 percent. The Orange’s three opponents have put up 44 3-pointers in the second half and made only nine of them. When they met during the season, Syracuse held the Blue Devils to 60. But then, the Orange only scored 44. How many flaws can that zone cover for? Syracuse was outrebounded 51-30 by Michigan State, shot under 32 percent the second half and still won. There is no such thing as an ugly win in March, but the Orange stretch that adage as far as it will go. No. 2: Kentucky on the march in March. On Valentine’s Day, the Wildcats had lost four games in a row and seven of 11 in the SEC, averaging only 65.1 points in those seven defeats. They’re 9-1 since, averaging 81.6. They trailed all of 1:21 in their first two tournament games, shot 53.4 percent, and in general looked like a time coming of age. “Just took us a long time,” John Calipari said. And now, at No. 5, they’re suddenly the highest seed left in the upset-ravaged South. Plus, the regional will be in Atlanta, which is an easy drive for Big Blue Nation. Everything — every last thing — has gone right so quickly. No. 3: More air time for Sister Jean. The NCAA tournament record for most cutaway shots of a nun has been shattered. Loyola Chicago team chaplain Sister Jean Dolores-Schmidt is one of the faces of the tournament, at the age of 98. And anyone doubting the power of her prayers, well, continue on to No. 4. No. 4: Loyola Chicago’s karma. The Midwest Regional will be played just down the street from the home of the College World Series. More pertinent, it’ll be played only 100 miles from the Kansas state line. So it’s the Sunflower State vs. the ACC. Duke, Clemson and Syracuse are all packed in the same bracket. But make no mistake, the Midwest is the Jayhawks and three visiting teams. The Wolf Pack will give nothing away in the sense-of-destiny department when they play Loyola Thursday in Atlanta. Not after storming back from 22 points behind in the last 11 minutes to stun Cincinnati. Nothing like going to the Sweet 16 after leading a game all of 9.1 seconds. Two days earlier, they rallied from 14 points back to beat Texas, hitting all six of their shots in overtime. But that was cake, compared to Sunday. Nevada leads the Sweet 16 in uniform combinations worn this season (12), twins (Cody and Caleb Martin) and transfers from four-year schools in the starting lineup (four). There might not be a more astounding stat anywhere in this tournament than the two turnovers they committed in 40 minutes against Cincinnati’s vaunted pressure. So now it’s Nevada vs. Loyola. Think about this a minute. One of these teams will be 40 minutes from the Final Four. No. 7: The Big 12 walking the walk. The league clamed all season it was the strongest in the nation. Well, 40 percent of the conference just strolled into the Sweet 16. But three of the four teams – Kansas State, West Virginia and Texas Tech -- face higher-seeded opponents, so it’s crunch time. No. 8: The Villanova offense at work. The Wildcats are the Swiss watch of college basketball, and the man directing all this precision, Jalen Brunson, is not only a national player of the year candidate, but Villanova’s first Academic All-American in 30 years, with his 3.34 grade point average in communications. Villanova had 38 assists for its 56 field goals in the first two rounds. The Wildcats also had 31 3-pointers, off nearly 46 percent shooting. If that keeps up, good luck stopping them. West Virginia will be next to try Friday in Boston, and the Mountaineers do like to make a mess of offenses with their pressure. 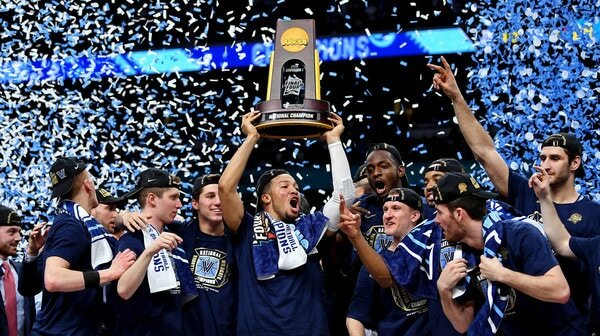 Last time Villanova played in a regional, it went right on to the Final Four. No. 9: Devonte’ Graham’s shooting. He was 10-for-31 in the first two rounds for Kansas. The Jayhawks moved on anyway, but had some nervous moments with Penn and Seton Hall. This week is harder. They likely won’t get away with that again. And for his next magic trick . . .
Only March can make a hero like this. The freshman reserve guard took nine 3-pointers for Michigan in the Wolverines run through the Big Ten tournament. He missed them all. He didn’t miss Saturday night, from 32 feet away, with a split-legged last prayer that saved Michigan at the buzzer and left Houston Cougars prostrate on the court in shock and grief. The Wolverines now get Texas A&M, last seen shredding North Carolina in its own state. Guess who’s the only team left from last year’s Final Four? The same program that graduated its top three scorers. But Mark Few has a machine and the Zags are back in the Sweet 16 – for the fourth consecutive year. And with Xavier and North Carolina’s demise in the West, the road is open to San Antonio. Gonzaga waited forever to get to the Final Four; now the Zags might make a habit of it. Of particular interest is Zach Norvell Jr., who watched all the excitement last year as a transfer. Now he’s in uniform and look what he’s up to: A late 3-pointer to put down UNC Greensboro, and 28 points and 12 rebounds against Ohio State. No. 12: Purdue vs. Texas Tech. Chris Beard. Now the Texas Tech coach. It’s a pretty safe bet that Purdue’s seniors and coach Matt Painter remember that night. The problem for the Boilermakers is they’re down a 7-footer with Isaac Haas’ injury. “We also showed we’ve got a lot of pieces,” Painter said of the win over Butler Sunday without Haas. It took a late 3-pointer Dakota Mathias so save them, who was asked if it was the biggest shot of his life. “This is 1, 2 and 3,” he answered. Feeling a tad conspicuous, Tigers? Clemson has won 11 tournament games and been to one Elite Eight in its history — 38 years ago. This is its first Sweet 16 in 21 years. And now the Tigers share a stage in the Midwest with Kansas, Syracuse and Duke – a blueblooded bunch with 36 Final Fours and nine national championships among them. But Clemson has ignored conventional wisdom all season, so this shouldn’t seem unusual. Plus, that 31-point splattering of Auburn in their bowl game – oops, second round game – should have gotten Kansas’ attention. No. 14: Texas A&M’s wild ride continues. Let’s see, the Aggies started the season 11-1. Then lost five in a row. Then won six of eight. Then last three in a row. If you need a Dramamine, by all means. What can Michigan expect? Billy Kennedy has used 10 different starting lineups, but seems to have found the right one, with the way they throttled North Carolina. The Longhorn State should be in this team’s corner. Nine of the 11 Aggies who played against the Tar Heels are Texans. Only six of last March’s Sweet 16 are back. Four of the 16 have never been to the Final Four, four more have not been this century. A lot of waiting could end next weekend. No. 16: The echoes of 1963. One last Loyola story. When the 1963 Ramblers reached the stage where this team is now – the Sweet 16 – they beat Mississippi State 61-51. It was more than just a regional game, but a landmark moment. A state injunction had been issued in Mississippi trying to prevent the game. This was 1963, and teams from Mississippi were not supposed to be playing integrated opponents, not even in the NCAA Tournament. The Bulldogs decided to defy the order and rushed out of town to the regional in East Lansing, before anyone could stop them. The Game of Change it came to be known, and there is a famous picture of the captains shaking hands before the tip. Jerry Harkness — one of four African-American starters for Loyola – and Mississippi State’s Joe Dan Gold. Gold died in 2011. That picture was by his casket. There at his funeral, weeping when he saw the photo . . . Jerry Harkness. Wonder what echoes from this Sweet 16 will be heard 55 years later? Maybe all the favorites left behind? “I think what you see happening in college basketball, it’s almost like a revolution,” Florida State coach Leonard Hamilton said, after dismissing Xavier. The last upset of an unhinged weekend.